HakeemOnlyFan, Smacktle, BallSoHarden and 6 others like this. how is it weird I'm a huge basketball fan and I'm going to be truthful. Harden is a beast but that move is a travel. If Harden was on any other team all you'll would be disgusted by the move. Smacktle, don grahamleone, DonKnock and 6 others like this. How can anyone even tell what a travel is anymore? How about a foul in the act of shooting? What about moving screens? There's no consistency to any of it. It's gotten as bad as defining a catch in the NFL. Smacktle, hakeem94, DonKnock and 1 other person like this. Y'all (well, OP) don't get it. Harden actually KNOWS the rulebook. I'm not sure why people haven't figured this out yet. He's a master of getting foul calls. Not because he acts. But because he KNOWS the rulebook, so USES the rules to his advantage. The surprising part isn't that he does this, it's that no one else historically has done it quite like he has. 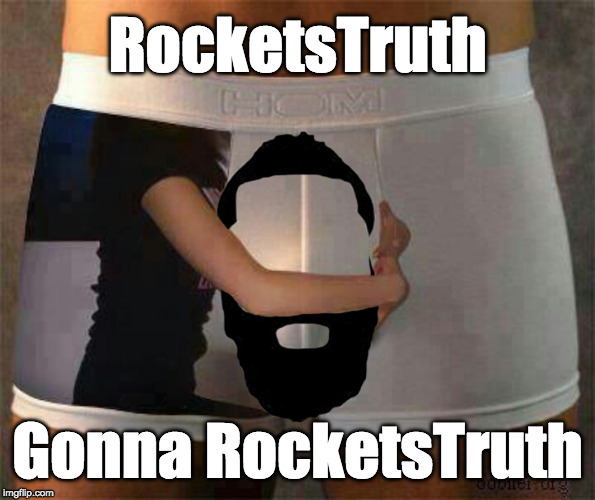 The NBA may and in the past has made adjustments to change how the refs are calling Harden. First he was getting "too many" calls on drives. Refs changed that, so Harden adjusted by just saying ok, I'll bait you into fouls on threes instead of drives. Well that pissed some people off, so NBA changed that rule last offseason. Harden saw that coming, so added a stepback, and took the time to UNDERSTAND the rules enough to know what was/is a stepback, and what isn't. The result is, he now has: Drives/drive fouls, threes/three fouls, eurosteps, step-back 3's and EVEN step back 3's fouls (and and-1 4 point plays). All of which makes me kind of hope the NBA looks at this in the offseason and changes the rule a bit, because Harden will add a wrinkle, and I'm curious what it will be. HakeemOnlyFan, darksoul35, kjayp and 5 others like this. well, if it's the truth we're after . . .
Smacktle and htownrocket87 like this. If you wanna try and get nit picky you could call about 50 carries in a game. Smacktle, kjayp, hakeem94 and 4 others like this. He travels on some and does not on others. There was one step back 3 last night that was a travel. did not see a stepback, but a drive that gets called 50 percent of the time. i didnt watch it closely or count the steps, but it looked like a travel. i am quick to rewind if i think he does because his game is fun to watch anyways. can you post which one? It's weird because you are campaigning AGAINST your own namesake. The NBA refs (you know, the highest possible authority on this matter) seem to think it is not a travel, but you, a so called "Harden fan" must know better. . I now repeat, go away you idiot. HakeemOnlyFan, Smacktle, DonKnock and 4 others like this. We need MOAR travel/gather threads...!!!! If Harden isn't an NBA player, he would have been an NBA referee. hakeem94 and Houstunna like this. hakeem94, don grahamleone, s3ts and 1 other person like this. Smacktle, hakeem94, don grahamleone and 1 other person like this. HakeemOnlyFan, Smacktle, DonKnock and 3 others like this. hakeem94, dkim1984 and Tfor3 like this. Can you blame him when his feet are quicker than his hand? Shut the F*** up, you hating b****. Smacktle, hakeem94 and Cash Cam like this. Even if it were a travel (it isn't), the league wouldn't do anything about it. It is a cool and exciting move, just enjoy it. Smacktle and hakeem94 like this. Smacktle, hakeem94, don grahamleone and 3 others like this. HakeemOnlyFan, Smacktle, DonKnock and 1 other person like this.